Home » Loneliness » Nobody Should Feel Alone. Please support all those who have family problems, health struggles, job issues, worries of any kind. It's important to remember that not everyone is surrounded by large wonderful families. Some of us have problems and sometimes are overcome with great sadness when we remember the loved ones who are not with us. And, many people have no one to spend their lives with and are besieged by loneliness. For those who struggle today or any day, you infuse their life with your presence. Surround them with peace, love and laughter. For those who think they are alone, May God show them they are not alone Ameen. God Bless these families. To all those who are experiencing any form of pain (emotional, physical, financial) I pray for each & every one of you. May Great God enter all of our broken hearts & to fill every crack with His Holy Spirit, love & peace of mind & body. Nobody Should Feel Alone. picture/image is an Inspirational Stuff to Inspire and Motivate You. You can download pics by just clicking on the Images. Thanks for visiting Truth Follower an online place for huge collection of inspiring pictures, quotation, and Sayings Images. 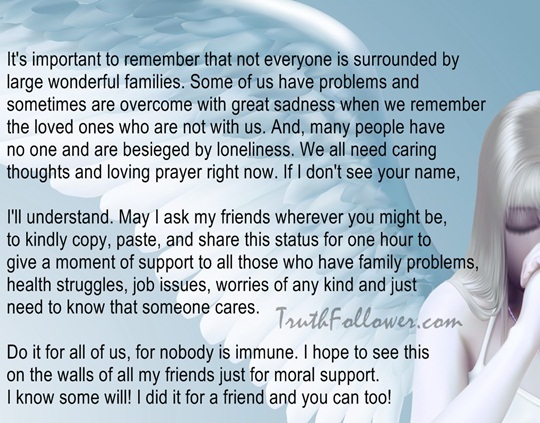 If you like Nobody Should Feel Alone., Please Share with friends and family on Facebook, Twitter, and Pinterest.